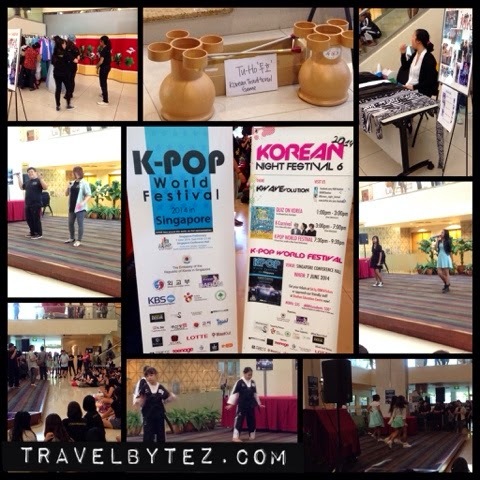 This year's Korean Night Festival was bigger than last year and was held at the Singapore Conference Hall. Just as the year before there were stations where one could try their hand at wearing a hanbok (and having your picture taken) and play traditional Korean games - a combination of Korean traditional and modern cultural booths. The Korean Night Festival also serves as a platform for singers and dancers (finalists on the K-pop World Festival Competition) to perform and get an opportunity to stand a chance to represent Singapore in the KBS K-pop World Festival Competition with an all expenses paid trip to Seoul if the winner is in the top 15 countries.